Fridg-Bi Ltd Belgium, since 1998 specializing in refrigeration for retailers and responsible for maintenance and installation of fridge systems and equipments. Fridg Bi Ltd finds a comprehensive and perfect service obvious. So even after the installation you can count on us! Professional and trusted. 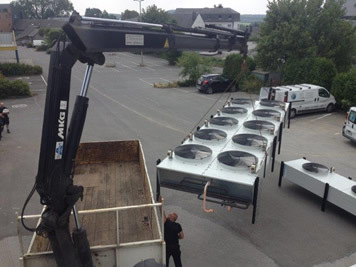 Regular maintenance is required because refrigeration systems and air conditioning systems should always work for one hundred percent. This ensures a long life and prevents interference. Moreover, the energy consumption of a well-maintained system remains within bounds. And that saves money and the environment! Therefore Fridg bi-maintenance and services is always available 24 hours a day. Additionally, you can close very attractive maintenance agreements with us. Tailored to your specific situation and installation as environmental regulations prescribe.